Less Pillow Time, More Puffiness? During Microcurrent consultations with clients interested in receiving facial treatments, there is usually a wish list of areas the client is wanting to improve. I have found one of the most popular areas of concern is puffiness under the eyes and how do we rid the puffiness using Microcurrent treatment? If you’ve had a fair amount of puffiness for some time, then it can be due to uneven fatty pads that form under your eyelids because of thinner skin in that area bulge out a bit, forming those lovely under eye bags. Long term under eye bags are largely genetic, and even happen to women and men who have low body fat on the rest of their body. We also have lymph in different areas of our face including above the eyes, just below the eyebrow and underneath the eyes. The Lymph can become stagnant, so we need to do manual Lymph drainage in those two areas, above and below the eyes, using specific gentle sweeping movements to not only stimulate lymph to get rid of lymphatic fluid, but also help to move any fat deposits out of the eye area as well. This may take 5 – 6 treatments to see improved results. It is important to go first to the upper chest area below the clavicle and stimulate the Lymph in that area so the lymph drainage from the eyes can flow easily out of the body and not get stuck there and stagnate. 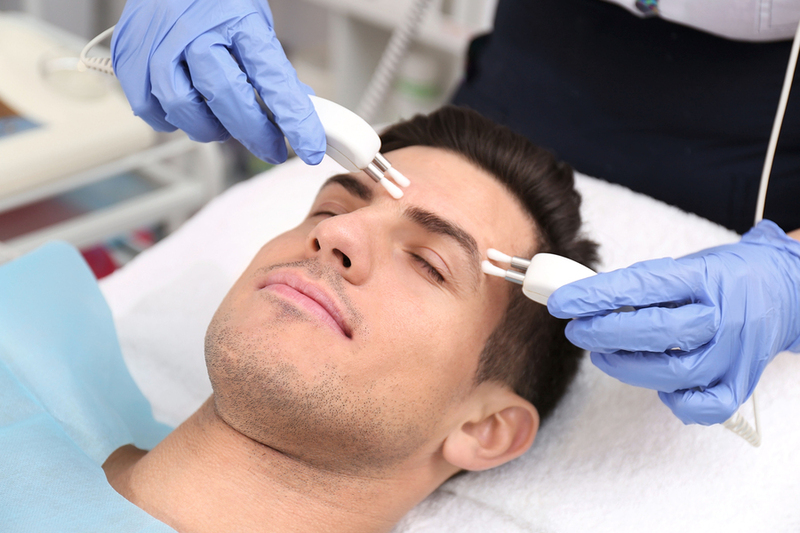 There are some short at home techniques of Lymphatic drainage that can be done in between Microcurrent facial treatments to help with speeding up the drainage of stubborn fluid or fat deposits that your Microcurrent Specialist is willing to share with you, so you are able to attain lasting benefits from the Microcurrent treatment. The Microcurrent is the preferred treatment of the stars just before a red-carpet event because there is no pain or downtime. Their skin looks refreshed, toned and radiant and the cost is minimal. The holidays are just around the corner, let’s get your eyes depuffed, open, lifted and looking brighter than ever!